LHA is the angle BNU on the Earth’s surface which corresponds to the angle ZPX in the Celestial sphere. 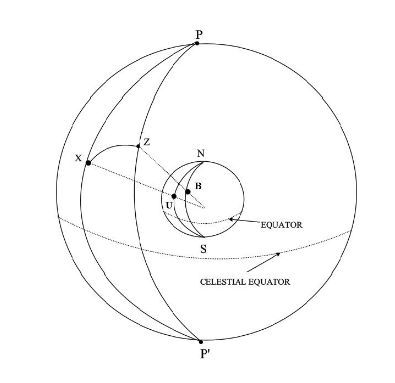 In other words, it is the angle between the meridian of the observer and the meridian of the geographical position of the celestial body (GP). LHA is measured westwards from the observer’s meridian and can be expressed in terms of either angular distance or time. For example, at noon (GMT) the Sun’s GP will be on the Greenwich Meridian (0o). If the time at an observer’s position is 2 hours and 3 minutes after noon, then the angular distance between the observer’s meridian of longitude and the Greenwich Meridian must be (2 x15o ) + (3x 15’) = 30o 45’. Because it is after noon at the observer’s position, the longitude of that position must be to the East of the Greenwich Meridian since the Earth rotates from West to East. Therefore the observer’s longitude must be 30o 45’ East and since LHA is measured westwards from the observer’s meridian, the LHA must also be 30o 45’. However, it should be noted that as the Earth continues to rotate eastwards, the GP of the Sun will continue to move westwards so the LHA at the observer’s position will be continually changing. Greenwich Hour Angle (GHA). As discussed above, the angle between two meridians of Longitude can be expressed as an hour angle. The hour angle between the Greenwich Meridian and the meridian of a celestial body is known as the Greenwich Hour Angle. 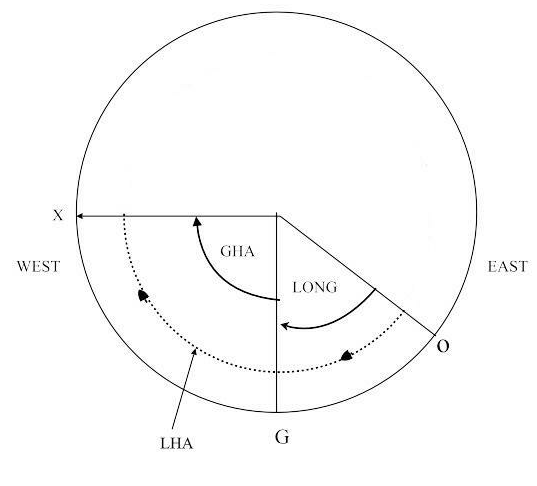 The Local Hour Angle between an observer’s position and the geographical position of a celestial body can be found by combining the observer’s longitude with the GHA as shown in the following diagram. O represents the longitude of an observer; G represents the Greenwich meridian; X represents the celestial meridian of a celestial body such as the Sun. In this case it can be seen that LHA is equal to the observer’s longitude plus the GHA of the celestial body. However, the method of calculating LHA depends on whether the observer’s longitude is east or west of the Greenwich meridian. A fuller explanation of this topic is given in the book ‘Astro Navigation Demystified’ but the rules below will help you to make the calculations without necessarily having a full understanding. Given as an example, that a body has a GHA of 30 Degrees and an LHA of 220 Degrees, what is the rule for returning the Longitude and ensuring its proper sign, that is, east or west?